Pumpkin seeds are delicious and often overlooked parts of a pumpkin that have many health benefits packed into their small shape. These benefits of pumpkin seeds include their ability to help strengthen your metabolism, boost your heart health, help you sleep, lift your mood, heal your body efficiently, protect your bones and even prevent cancer. Pumpkin seeds are the flat, oval-shaped seeds of the pumpkin or squash, both types of seeds have nearly identical benefits. Pumpkin seeds are valuated as a source of zinc and their consumption is recommended as a good way of obtaining this nutrient. The staggering health benefits of pumpkin seeds come from its unusual nutritional composition, including impressive levels of manganese, tryptophan, magnesium, copper, phosphorous, zinc, iron, and protein, as well as smaller amounts of B complex vitamins, and vitamin A. Furthermore, pumpkin seeds have phytosterols, an organic compound that also contributes to its healthy qualities. Let’s take a closer look at some of the health benefits of pumpkins seeds below. About 60% of men over the age of 50 suffer from benign prostate enlargement. Pumpkin seeds are valuated as an important food for men’s health, because of the zinc in their content. Zinc is very important for prostate health, it helps for improvement of urinary tract and the extracts of pumpkin seeds oil play an important role in healing benign prostate enlargement. Eat a handful of pumpkin seeds every day for treating benign prostate hyperplasia. 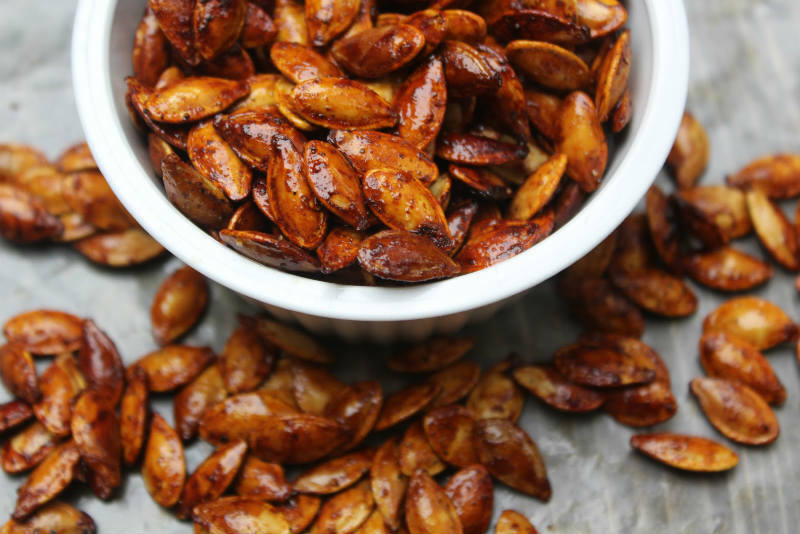 Pumpkin seeds have anti-inflammatory properties, and this is the most common use of them. Inflammation is a result of many deficiencies like various minerals and vitamins, and protein. Arthritis, an inflammatory condition, can be debilitating. In order to keep the tissues repaired and healthy, take healthy amount of protein and huge amount anti-inflammatory compounds. Put a few drops of pumpkin seeds oil on the affected area and massage it two times a day for reducing the arthritis inflammation. As we already said, pumpkin seeds are rich in magnesium, which fights insulin resistance and prevent diabetic complications and diabetic kidney disease. Pumpkin seeds are considered as a healthy food for people who suffer from diabetes. If you are one of them, you should eat two tablespoons of the seeds each day. Pumpkin seeds have effect on osteoporosis because of the high level of copper, calcium and zinc they have. These minerals increase the density of bones. The everyday intake of pumpkin seeds may reduce the symptoms of osteoporosis and reduce the weakness of bones. Pumpkin seeds can calm you down and give you a good night’s sleep. This is because they have magnesium and tryptophan which are connected with soothing and sedation qualities. So, if you feel stressed after a long working day, a hand of pumpkin seeds can help you calm down. Phytosterols is connected to lower low-density lipoproteins cholesterol levels and it is one of the organic compounds in pumpkin seeds. To achieve this you need a regular consumption of pumpkin seeds. Two to four tablespoons of dry roasted pumpkin seeds each day can help you lower your low-density lipoproteins cholesterol levels. Do not add salt. The organic compound in pumpkin seeds, phytosterols, may reduce the risk of heart attacks and strokes. The levels of the copper can increase red blood cell count in the body and improve flow of blood through vessels. Magnesium, also, helps control high blood pressure and prevents heart attacks and cardiac arrest. Add pumpkin seeds in your food to reduce the risk of heart diseases. It is recommended to use pumpkin seeds in order to get rid of intestinal worms. A so-called cucurbitacin compound in pumpkin seeds can eliminate parasites from the body with its anti-parasitic properties. To reach this result, chew pumpkin seeds every morning before breakfast until you get rid of intestinal worms, and drink a lot of water to expel the worms. Pumpkin seeds are a great source of minerals as magnesium and zinc and Omega 3 fatty acids. Zinc plays an important role in helping boost your immune system. Pumpkin seeds also contain many antioxidants that are essential for healthy body. In order to keep you immune system strong, start your day with pumpkin seeds. They will help you increase your level of energy and improve your metabolism. Pumpkin seeds can calm you down and give a good night’s sleep because of their serotonin and melatonin content. In a glass of milk, add one tablespoon of pumpkin seeds powder and drink it before you go to bed.